Cats are amazing, intelligent creatures. Their lifestyle reflects the predatory skills and behaviors needed to hunt food in the wild. A cat’s day includes the need to rest, stalk, chase, pounce, kill, play, eat, and groom among other things. When we don’t provide them opportunities to do these things, they get bored. Boredom can lead to a variety of problems such as destructive behaviors, aggression, anxiety, and more. We all want our cats to be living their best lives! Cats must have opportunities to express their natural behaviors. An enriched environment should provide various types of scratching surfaces, outlets for predatory and prey behavior, safe places, and should respect all five of your cat’s senses which provides an environment in which an animal has variety, choice, and control over their daily activities. How Do You Provide Enrichment for Your Cat? Food puzzles help to slow down eating, prevent boredom and obesity, and allow cats to eat more instinctively by allowing them to forage and “hunt” for their food. There are various food dispensing toys for cats that you can purchase, and you can even make your own. Start with an easy puzzle and work up to more difficult puzzles based on your individual cat’s preference. Lunch paper bag/paper bag: put catnip, catnip covered toy mice, or treats inside. They can explore, pounce, and kill (destroy the bag) It’s a great hiding space and a fun toy all at the same time. Paper towel roll puzzle toys: cut paper towel roll in half, fold in ends and cut a few small to large holes, place in treats. As cats begin to use these more, cut smaller holes to make it more fun for the cats! Scent signals are an important part of cat communication and exploration. Cats exposed to new odors are more active and exploratory. Catnip, silvervine, cat grasses, safe houseplants, toys with owner's scent, and pheromones such as Feliway all help encourage exploration and play. Placing a small amount of a scent in paper ball toys, boxes, bags, etc. can provide sensory enrichment. Visual: A few examples of visual enrichment include interactive cat toys, birdfeeders, cat videos on YouTube, blowing bubbles, and pinwheels. Remember, when playing these videos or letting your kitty watch birds only do so for short periods of time to avoid your cat from becoming frustrated. Auditory: This can include reading a story to cats, playing bird and nature sounds, and playing music made specifically for cats. (Through a cat’s ear, iCalmCat). Touch: Many animals respond positively to things like petting and brushing. Along with the touch comes social interaction, which ensures that these social animals receive the attention they need. Make sure to identify the kind of touch the cat appreciates. A great example of sensory enrichment that hits all their senses is placing delicious treats in a ball pit for your cats to forage around for. Provide a variety of horizontal and vertical perches and hiding places. Cats will enjoy things like window perches, cat trees, and cat-friendly shelving. Incorporating safe hiding areas is also crucial and allows the cats to get away if needed. Hiding places can be cardboard boxes, tunnels, and paper bags. Cats also need to scratch, so provide various types of scratching surfaces. Scratching posts should be steady and a minimum of three feet to allow them to fully extend their body when scratching. All companion animals, including cats, benefit from positive, consistent interactions with their humans. Cats will experience less stress when allowed to choose whether or not to interact with you, rather than having interactions forced upon them. If the cat appears relaxed and wants to interact, it's best to focus petting around the head and cheeks. When your cat moves away, don't force further contact by following your cat or picking them up. Brushing and petting your cats before bed is a good example of how to provide them with positive, consistent, and predictable social interactions. You can give your cat some safe time outdoors by building an outdoor enclosure (often called a catio) and/or walking your cat. Cats can be harness trained or can enjoy walks in a cat stroller. Another form of enrichment can be clicker training your cat. Cats are intelligent and clicker training is a great way to mentally stimulate your cat and teach them new tricks! 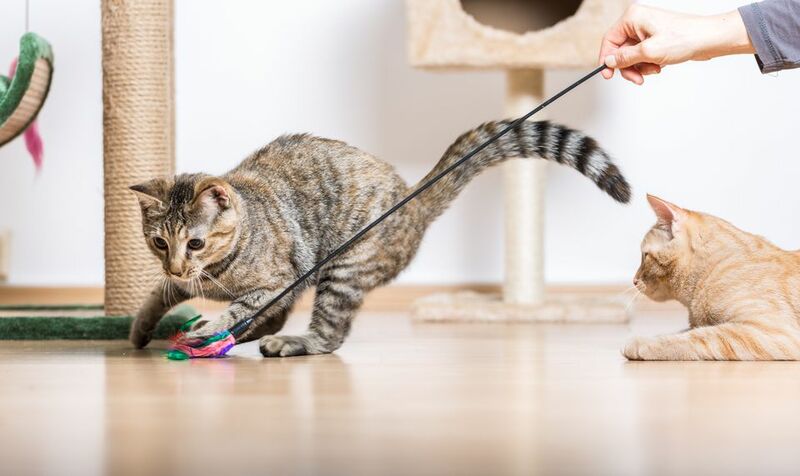 There are many benefits to clicker training your cat, it boosts your cat's confidence, encourages creativity and initiative, and helps strengthen the bond between you and your cat. There is a common misconception that cats cannot be trained and if they can be trained, it is a lot more difficult than dogs. Both of those statements are false. When owners feel that their cats cannot be trained, they also believe cats behavioral problems cannot be resolved. This can often result in fatal consequences for cats; including euthanasia and relinquishment. Cats can be taught everything including foundation behaviors (targeting, attention), positive husbandry behaviors (nail trims, brushing, and handling), and fun tricks (roll over, high five). Training can also be very effective in stopping and replacing unwanted behaviors. In addition to the recommendations mentioned above, remember to always provide your cats with variety and choice and see what they like best. Lastly, the types of enrichment you can offer your cat is only limited by your imagination so have fun with it!